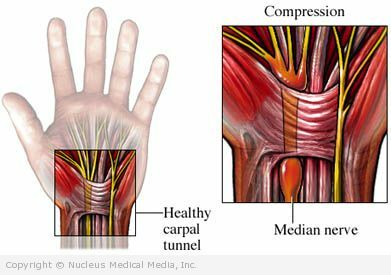 Carpal tunnel syndrome is a nerve disorder of the hand caused by compression of the median nerve. The median nerve gets squeezed inside a narrow passage in the wrist called the carpal tunnel. This nerve provides feeling to the thumb, index and middle fingers, and half the ring finger. The doctor will ask about your symptoms and medical history. An examination of your arms, wrists, and hands will be done. The physical exam will include tests of strength, sensation, and signs of nerve irritation or damage. It is important to correct whatever is causing the carpal tunnel syndrome. Sometimes making simple changes in your workplace or home may help relieve symptoms. Rest the wrist by keeping it straight and decreasing activities that worsen pain. Elevate the hand above the heart to reduce swelling. Do exercises as directed by your healthcare provider. A splint will prevent extreme movements of the wrist. It is most effective when worn at night. It can help you avoid waking up with symptoms. Surgery may be needed if symptoms are severe or continue after trying other treatments. The most common procedure is the carpal tunnel release. If you are diagnosed with carpal tunnel syndrome, follow your doctor’s instructions.